Money Secrets of the Amish takes Lorilee Craker on a mission to find the secrets to the Amish surviving the economic crisis in a way us ‘Englishers’ were unable to. “Thrift, common sense, wise money management, delayed gratification, etc. are taught from the time (they) are knee-high to a grasshopper”, Lorilee writes. She has a difficult time getting definite answers from those she interviews on the ways that they save money. Being humble, they are not boastful of their ways, or maybe as aware since they were taught at such a young age. Rather she got many of the suggestions from her observations of their way of life. One major difference is that they do not use credit cards, and save for the things they need, no matter how long that saving may take. They do not indulge in things of the world as we tend to do. Their large gardens, raising animals, and many talents and skills lend themselves to bartering with each other, and being self-sufficient in many ways. Lorilee hit on the Amish being very much into shopping resale, and thrift stores, of recycling things they have for another purpose and reusing items until they are totally worn out. The Amish are humble in their gift giving and their ‘wants’ of things new and worldly. I didn’t actually find this book to be much different than others on saving money and thrift. Not much different than Dave Ramsey’s and some of the financial gurus on how a Christian should live and save money. The basic message I find is that the less worldly you are, and the more focused on things not of this world, the less money you will spend. I wasn’t blown away with the suggestions being a farm wife myself, many of them we already take into practice. To remember also, without the use of electricity the Amish are spending much less on things we find to be common utilities; Car insurance, gasoline, electric bill, water bill, mortgages, home insurance, internet service, cable, phone service, cell phone, and etc. Not even to add in the things we think we want and don’t need to fit in with our society today. 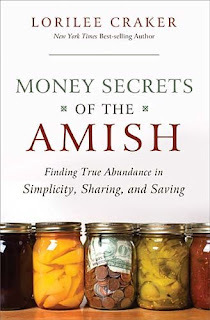 The subtitle of the book is “Finding True Abundance in Simplicity, Sharing, and Saving”. I think that the lifestyle of the Amish gives us much to glean from in these areas. I think us as Englishers can apply much of their humbleness and satisfaction in the simple things to our lives and get similar results. I received this book from Thomas Nelson Publishers and in no way has that influenced my review of this book. I'll just throw in a few thoughts. Many of my neighbors are Amish...and I'm fairly good friends with one. I totally agree that they use and reuse and go without. However, my neighbor shares a phone that is in a shed with another family...so there is a telephone bill. Also, she uses the electricity of a farm for a freezer, and they pay for that. She told me once that it costs about $4o to go to a neighboring town by hired car. It's only about 20 minutes away, and I think that's one way fare! They are incredibly generous, and I have to say I typically feel like a pretty plain woman without much vanity...until I see how she lives. She is so hard working, too! Annette you are so right about their generosity and gentle spirits. The problem with this book is that the author didn't seem to desire those characteristics. She was very worldly in my opinion in the 'things' that she wanted. In a sense I felt like she was just cashing in on the 'amish' feel for the book.